Blue. A deep blue—but I also like green. Maybe teal? turquoise? I don’t know! Definitely dogs, but I have both. They’re bare right now! If they’re ever colored though, it’s almost always blue. I don’t know why. Um… the United States (obviously, but I’m still counting it) England, France, and Cuba. So, four. So many good ones! But definitely The Bell Jar by Sylvia Plath. Emma Watson. Without a doubt. “Someone Else” by Miley Cyrus and “First Day of My Life” by Bright Eyes. Nonfat Chai Latte 2 pump chai 1 pump Vanillla. Yes, I’m finally the person with the long, specific order. Homemade smoothies. I have them everyday at home. Depends on who’s driving… No, probably anywhere from 2-3. It just depends on traffic. Not long though. The first one is thesaurus, because I use it on almost every school papers. It’s my hidden trick to expanding my vocabulary and have my teachers think I’m a lot smarter than I am. ;) This next one will seem probably be weird but, whatever. The majority of my bookmarks aren’t necessarily frequented websites—I use my dashboard for that, but they are mainly random websites I stumble across and don’t want to forget about. So, the first one is a buzzfeed feed link I stumbled across in my facebook newsfeed one time that is a list of incredible places to visit in France. A goal of mine is to live in Paris for, hopefully, at least a year. I, like many others, am in love with the city, so this link I like to keep just because I think it’s beautiful and great motivation. Here ‘s the buzzfeed link of the places in France. I have a 500 Days of Summer Poster because it’s one of my top three favorite movies. And I also have postcards I bought when I visited Cuba earlier this spring. (It was legal—I did it through my school). Harry Potter? Hmm… Maybe Great Gatsby—without the dying. Can I alter the ending? Ooh! Or Hannah Montana, if I got to have the double life. Yes, definitely that. Volleyball and dance. I don’t have the best coordination when it comes to sports with balls. Somehow volleyball works, but it’s a very steep slope from there! Paris, France. It’s been my longtime true love. Waking up in the morning and losing things. I’ve always liked the name Jane. For me, it’s perfect. Basic, understandable, but not too common. I think it’s so pretty. “You can’t sit with us!”/”She doesn’t even go here!” both from Mean Girls because of how much I use them. Oh wait, I also really like “Now if you two don’t mind, I’m going to bed before either of you come up with another clever idea to get us killed—or worse, expelled” from Harry Potter and the Sorcerer’s Stone. After reading Elizabeth’s, I also have to mention I love “So, this is my life. And I want you to know that I am both happy and sad and I’m still trying to figure out how that could be”—also, from Perks of Being a Wallflower. Hey World! So, I’m Emma, or Emma Robertson, if you want to be formal. I’m really bad at introductions. I never quite know what to say, and I always end up rambling. I can’t wait to get this blog up really going! 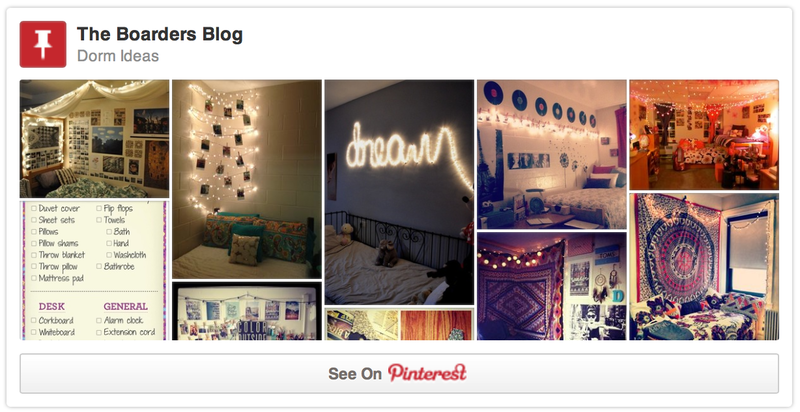 I know I have tons of ideas for this blog, so don’t give up on us! To continue like my two fabulous friends have done already, here’s a day in my life. Actually, here’s Thursday of last week for me. Like Elizabeth, I’m a boarder at the Thacher School. A day in the life of me is pretty long. I’m the kind of person who takes forever to do homework and spreads herself slightly too thin with extracurriculars, so I always feel like I’m catching up. I’m also a pretty impressive procrastinator as well, so I tend to scramble last minute to get my school work in on time. Because of this, I tend to wake up around 6, plus or minus a half hour or so. I try to keep my mornings productive, whether I’m doing work, working out, or something else. After breakfast, I have my classes, or as it’s called the “Academic Day,” here at our school. Here’s me getting ready to go to my first period French class. Because we live on campus, our dorms are extremely close to the classrooms. I can walk from my bedroom to my French class room in about a minute. #boardingschoollife Is that weird if I hashtag? It probably is, but whatever. During the day I had gotten an email from our “Student Store” (where we buys snacks and toiletries and school supplies), which said I had received a package, so before heading back to the dorm I grabbed it. 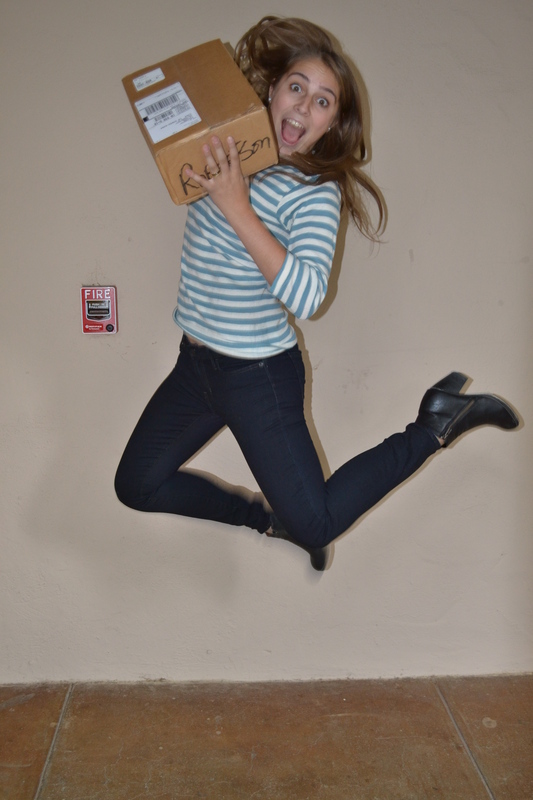 Here’s me with the box! Surprisingly, this photo only took one try to get me in the air. Credit to my friend Kathryn, who’s not on here. The package turned out to be a cute little care package from my parents. They have just returned from Europe, and they sent me a couple gifts from my favorite bookstore. It’s called Shakespeare and Company. I’m don’t konw if anyone else has heard of it it’s famous for being the English bookstore that 20th century writers would live/stay in when they came to Paris. It’s the cutest and most peaceful thing. After all my classes I have volleyball practice. I play back row for libero on varsity. Do any of you guys play? I love volleyball because it’s very much of a team sport, and it gives me a chance to make friends with people in other classes, who I might not know as well otherwise. My team is like a family. We’re all silly and crazy together. Lately, we’ve been listening to and reviewing Miley Cyrus’s new album Bangerz en route to our away games. What are your guys’ thoughts on it? During the winter and spring trimesters, I am on the dance team with Morgana. Dancing is my true love, but I do give it up for one trimester to play volleyball. After sports, we have formal dinner. Formal dinner happens four nights a week, and guys must wear suit and tie, and girls, dresses or dress pants and heels. Although I wish we only had it say three nights a week, I do like the opportunity to get all dressed up. During dinner, we have randomly chosen assigned seating that switches every two weeks, so it’s also an opportunity to get to know everyone at our school. Our school is the type where you know everyone’s name, and everyone says hi to everyone. After formal today, I actually have a debate because I’m in the debate club. I know—I’m kind of a huge nerd. This one is whether or not state’s should be allowed to include the confederate flag on their state flag. I’ve been assigned to argue that they should be allowed to. Generally, during this time after formal, I don’t have anything to do, so I would watch TV. Like, Morgana, I have been geeking out over American Horror Story and Evan Peters—especially Evan. :) Considering he’s dating Emma Roberts, I like to think if I could just drop the “son” from my last name, he could be dating me, too! Being a dedicated fan back to season 1, I couldn’t be more excited to have not only Evan Peters but also Taissa Farmiga back. This is becoming long, so I feel like I should wrap this up pretty soon. After formal we have study hall, which is the period from 730-930 that we are supposed to dedicate to beginning our homework. Here’s my desk. 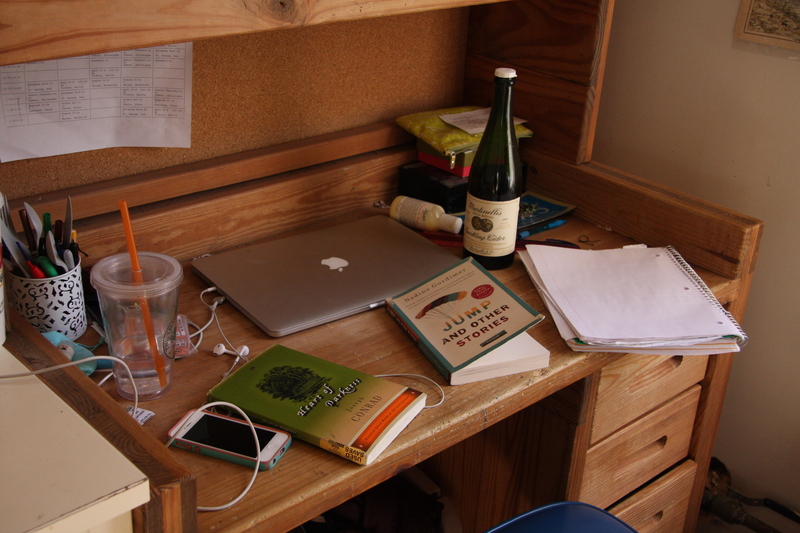 It’s pretty messy right now, but it has my computer, headphones, two of the books we’re reading in English class, Martinelli’s Sparkling Apple Cider :), and my pencil cup, which also includes the silverware I use while camping and in the dorm. That sounds weird out of context, but it’s a very normal thing at our school to use our camping silverware in the dorm! I know my friends already explained 930-10, so I won’t again, in order to try and keep this post from becoming an essay. During 930-10 I usually hang out with my boyfriend of just over a year. Then at 10, we have check-in, and the rest of my night I either do more homework or hang out with friends. Overall, this is a pretty average day for me. Nothing super exciting, but I really enjoy living here! If any of you have any questions at all about boarding school life, or life at our school Thacher, specifically, feel free to leave a comment! I’d be happy to answer it! 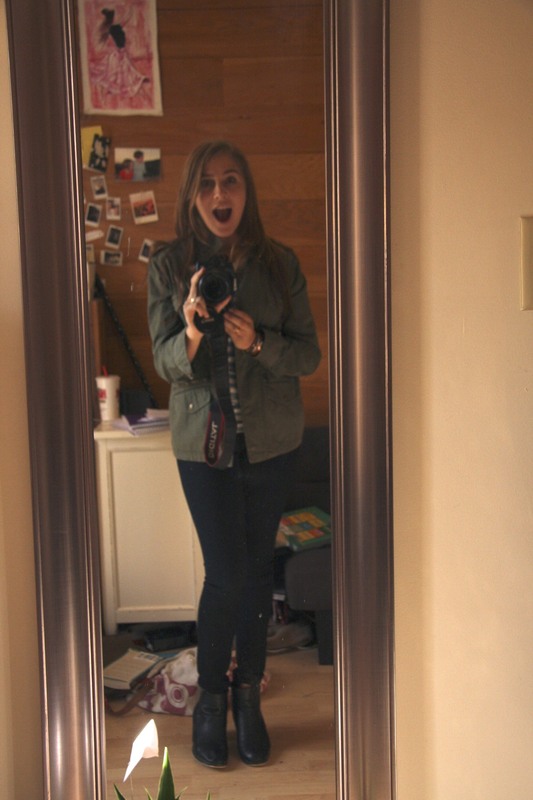 My name is Elizabeth and I am a boarder at the Thacher school. 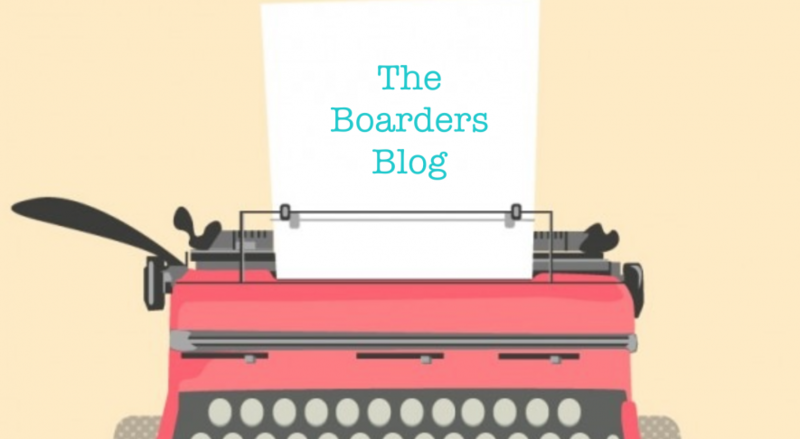 A day in the life of a boarder is hectic and stressful but the funnest and most fulfilling. It starts off with me waking up at 7:30am to my alarm which is Pocket Full of Sunshine by Natasha Bedingfield. Then I set up my morning playlist which currently is Lorde’s new album. I open my closet, pick my outfit depending on Ojai’s capricious weather. I pack my bag according to the classes I have before my first free. Then I am out the door running so I can catch the teacher on duty to check me in before 8:15am. As an underclassman at Thacher, you are required to attend breakfast check-in every weekday at any time from 7:15 to 8:15am. My breakfast is usually a bowl of mini wheats and milk. I sit down with my class and enjoy my bowl of cereal simultaneously socializing with my fellow classmates. This lovely event only lasts for five minutes before everyone starts clearing their food to get to class. My first class of today is English. We are currently reading Jump. 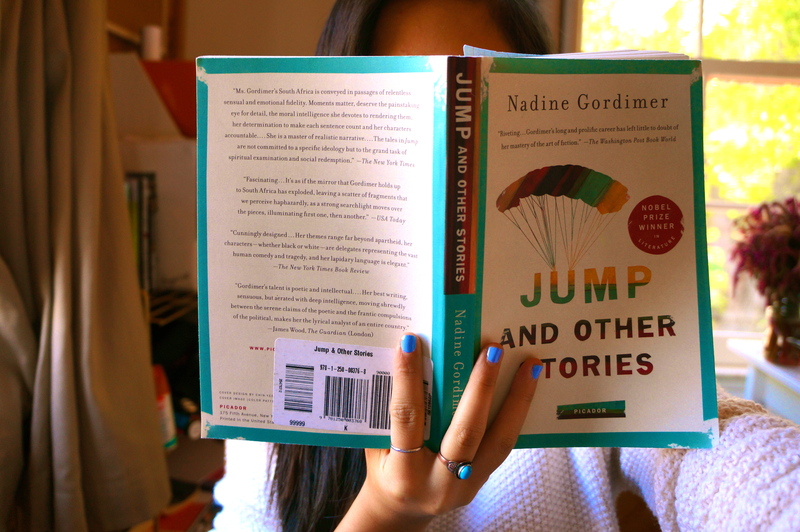 Jump is a collection of short stories written by the phenomenal nobel prize winner, Nadine Gordimer. So far we have read six stories, and in class we discuss the previous night’s reading. My favorite story from this book so far is, Some are Born to Sweet Delight. I highly recommend the book, it promises a good read. Then from 9:15 to 9:55am I have a free period, however part of this free usually goes to meeting with my advisor. 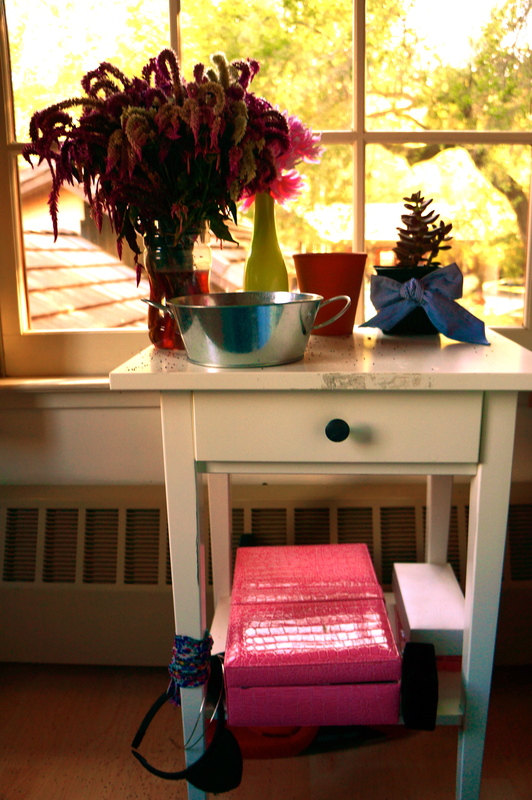 At Thacher, all students have a faculty they can go to for advice or help. I talk to him about my social life, love life, academics, sports and so on. 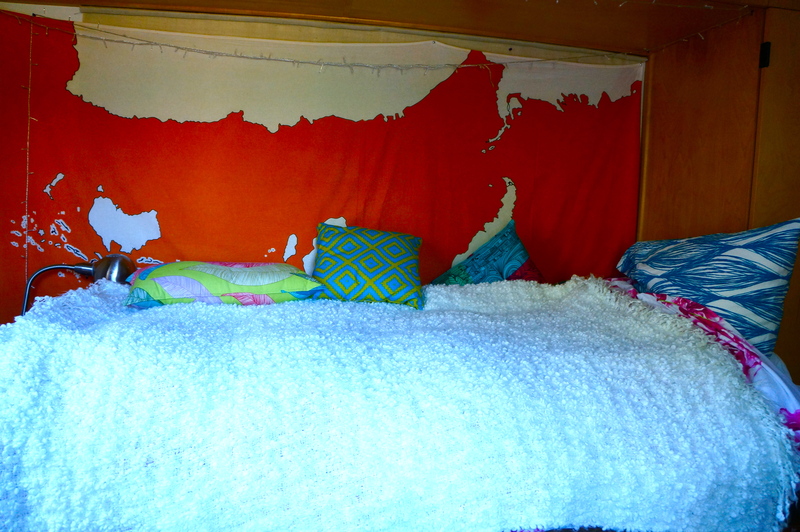 Then for the rest of my free, I return to my room, switch out my books, and relax for a while. Finally, it is lunch time. At 11:30 I leave my things in my room and I head to the dining hall for some food. 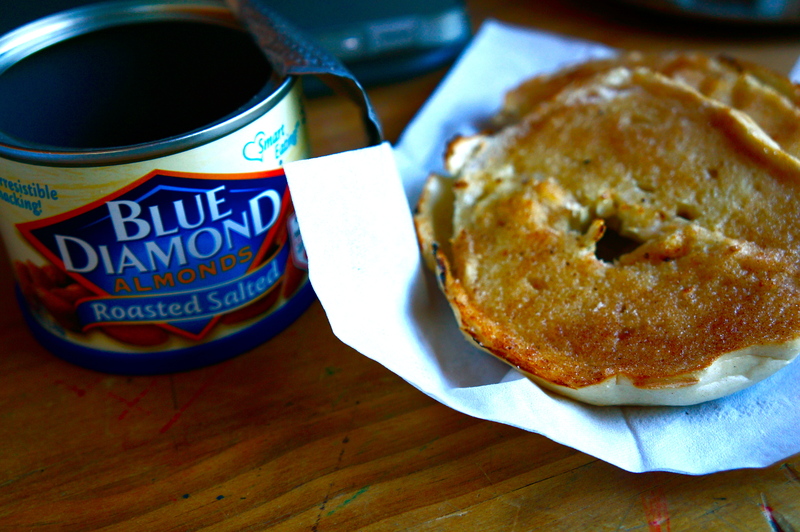 I wasn’t extremely keen about the food options today, so I made a cinnamon bagel and had some salted almonds. Unhealthy but easy, quick, and delicious. After lunch I have the rest of my classes. At 3:10pm classes end. I return to my room to change, grab a quick bite, then out the door I go to dance. 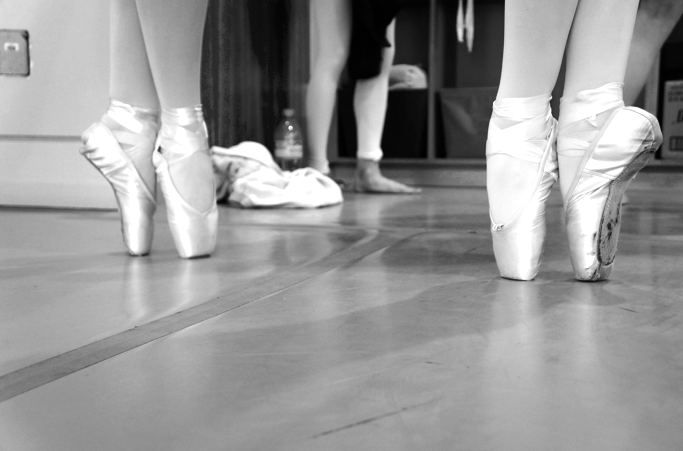 Dance is from 3:35 to 5:00pm everyday. We do a little bit of jazz, modern, ballet, and occasionally we have a class dedicated to stretching. My amazing friends on point. I am an amateur, who will never be skilled enough to do that. After dance, I’m all sweaty and disgusting so I hop in the showers to get myself cleaned up. I pick out the dress I shall wear to formal and coordinate the rest of my outfit according to that dress. At 6:10pm a couple of girls and I walk out to the pergola right outside the dining hall. We wait for the staff to open the doors as we socialize amongst our class mates, or check our mailboxes. Every student is assigned a table to sit at, this table changes every three weeks. The purpose of this is so one is given the opportunity to communicate with fellow students that you wouldn’t get to know otherwise. From 7:30 to 9:30pm we have study hall. This is when all underclassmen sit down in their rooms to work. 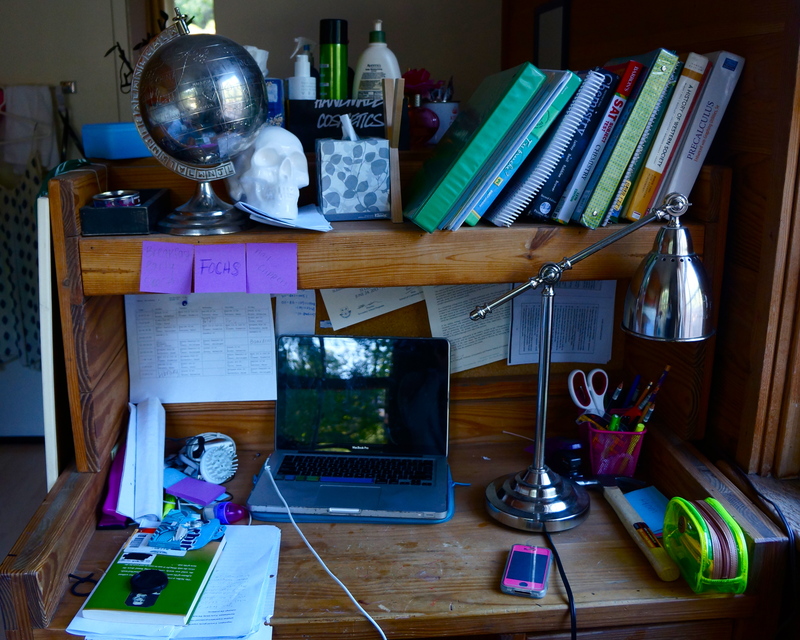 My desk, where I study. At 9pm, I leave study hall early because I have rehearsals for the play. The fall play we are currently working on is, Our Town by Thornton Wilder. The cast is tiny, only fourteen people are acting. Despite that, it is still so much fun. Usually rehearsals last for around 30 minutes, so I still have time to hang out with my friends in the commons. At 10pm we return to the dorm and get checked in for the night by our prefects. All lights have to be out by 11pm. The second my head hits my pillow, I am asleep. That is a day in my life! Tina Fey, because our friendship will consist of laughter. I will have the happiest life. White Teeth Teens by Lorde. Currently listening to this all day everyday. Vanilla latte in winter, Cookie crumble frappuccino in summer. It takes thirty minutes to drive from my house to the airport. The flight from Beijing to LAX takes fourteen hours. The drive from LAX to Ojai lasts for two hours. So overall, it takes sixteen hours and a half for me to reach Thacher. A constantly expanding collage of magazine images that I like. Breakfast at Tiffany’s. I mean, who wouldn’t love to wear a Givenchy LBD, look like Audrey Hepburn, and fall in love with a handsome man. Now that I’m at boarding school, home. Feet. Unless they are baby feet and are well moisturized. My name’s Morgana, and although I go to a boarding school, I’m a day student. The year I started high school was the same year my older brother left for college, and my mother just couldn’t handle losing us both the same year. Although I’m a sophomore, I quite enjoy being a day student—it has it’s perks. Plus, in December I’ll be able to get my license! So that’s definitely an advantage. I usually start my day off by waking up at 7:00, throwing in my contacts, setting up my morning playlist, and hopping in the shower. I don’t usually eat breakfast (I know, breakfast is the most important meal of the day blah blah blah…). If I have time though I’ll grab a banana and eat it in the car. That’s if my mom refuses to let me drive to school. I’ll be taking my driver’s test in December so I need to rack up all the experience I can get! Therefore, food can wait. I arrive at school around at 8 to 8:10, which is plenty of time to get my books ready before classes start at 8:30. Yes, I’m that one kid that feels the need to carry a briefcase to school. Not to be hipster… ahahah I actually have this admiration for briefcases in which I’ll go to thrift stores and just kind of collect them. Classes are pretty normal, I have them everyday, so nothing special. My favorite class is photography. Art classes are always the best classes to me. It’s so much easier being creative then reading out of a textbook. Although classes are pretty much the same, the real fun comes during the free periods! In which I’ll usually sit in the day student room with my friend Emma watching Teen Wolf. It’s our new obsession, but after every show we always find a new one to start. American Horror Story recently came back so we just started that. If i haven’t mentioned, I’m kind of in love with Evan Peters. Well more his character Tate Langdon… and actually every other character he plays in AHS… but mostly Tate.